It’s rare that the taste and texture of a cracker get equal billing, but they do in this recipe. The marriage of rosemary, pecans and Parmesan give them alluring flavor and their texture is also divine. They manage to be crispy while still tender. At first they are flaky and then they simply melt in your mouth. Dorie Greenspan gave me the idea of making crackers with Parmesan and pecans. 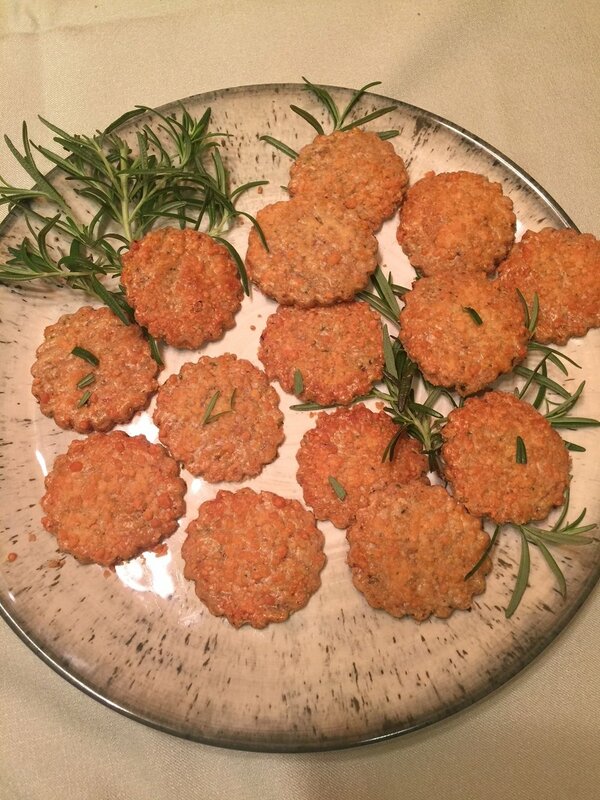 In her book Dorie’s Cookies she calls crackers savory cookies. And although I am a huge fan of Dorie and her baking, her savory cookie recipe didn’t quite work for me. I had to make it several times, reducing the butter, upping the pecans, omitting the egg yolk, until I finally met success. My final addition is Aleppo chili pepper flakes. You can substitute red pepper flakes, but I prefer Aleppo because they add a light hit of peppery spice on your palate without paralyzing it. If I had a nickname it would be the shortcut cook. To really save time when cutting these, you should use square cookie cutters. Simply cut out the cookies right next to each other, lining up each cut, so there is no extra dough between them. There is very little re-rolling with this method and the cutting goes super fast. Serve these little gems with a glass of bubbly or dry white wine. Or add them to a platter with other appetizers. Or serve them with soup or salad. You’ll be glad you did. To make the dough: In a food processor, pulse rosemary, pecans and cheese until finely ground. Add the flour, pepper and salt, and pulse until combined. Sprinkle the pieces of butter over, and pulse until the mixture resembles coarse meal with some pieces the size of small peas. Sprinkle 1 tablespoon ice water over, and pulse until the mixture begins to clump together. If it is too dry, add more water a teaspoon at a time. You want the dough to hold together when pressed, but not be wet. Preheat the oven: Heat the oven to 350℉. Line 2 baking sheets with parchment or Silpats. To cut: Working with one round of dough at a time and using a 2-inch cutter, cut out as many circles or squares as close together as possible. Transfer to prepared sheets, spacing them about ½-inch apart. Reroll scraps. Brush the cookies with the egg wash and sprinkle with the Parmesan cheese. To bake: Bake for 15 to 17 minutes, or until golden brown. Cool slightly and remove to racks to cool completely. To make ahead: Crackers may be stored airtight for several days, or frozen for several weeks.